How times have flown in the world of the MiniDisc. In the 1990s, the production volume of audio cassette tapes were on a continuous rapid decline - no thanks in part to the establishment of the compact disc media, which had quickly replaced analog audio technology due to its digitally-based, high speed random access and direct search capabilities. But compact discs are a read-only media. So Norio Ohga (Sony's President back then) decided that a new media was needed to replace the aging cassette tapes, and challenged his engineers to develop a recording and playback device that uses a disc smaller than (yet, as good as) the CD to replace the audio cassette tapes (CD-R and CD-RW media were pretty much unheard of back then, you see). Then in May 1991, with all developments concluded, the new audio standard, the MiniDisc was announced. Sony then made a call upon various hardware and software manufacturers to endorse the MiniDisc system. A product launch was then projected for the end of 1992, and the rest, as some would say, was history. Fast forward to circa November 2002, and the world was introduced to the, well, world's smallest and lightest MiniDisc player in the form of the MZ-E10. Available in Japan since that month (and only in Singapore this year), the MZ-E10 was one of four Sony commemoration models to celebrate the behemoth company's 10th Anniversary of its MiniDisc division. And if you're wondering, the other three models are the MZ-N10 (essentially the recordable cousin of the E10), the LAM-10 and Z10 (both of which are desktop MD systems). We'll take a look at these three other anniversary models some other time, but for now we'll get our hands full with the MZ-E10. 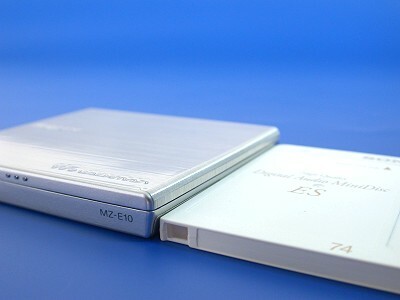 The MZ-E10 is only about 1/3 thicker than a minidisc. At just 9.9mm thick and weighing only 55g with a built-in battery, the MZ-E10 is really one of, if not the smallest player around. 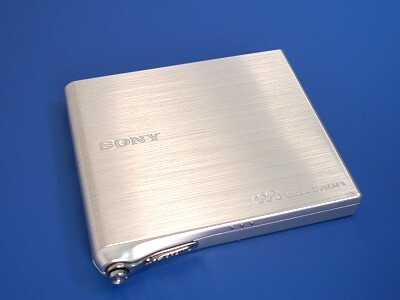 And along with its signature magnesium-alloy body, the MiniDisc walkman can easily pass off as a metallic cigarette case or a namecard holder.